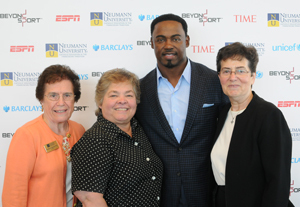 Former Philadelphia Eagle Brian Dawkins speaks to about 300 students, faculty and participants of the Beyond the Divide conference Sept. 10 at Neumann University in Aston. Franciscan Sister Marguerite O’Beirne, vice president for mission and ministry. Playing sports provides many valuable life lessons such as how to work as a team, how to be a good sport and how to get along with others. 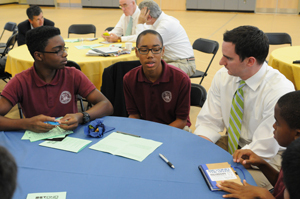 The last lesson was incorporated into a “Beyond the Divide” conference hosted by Neumann University Sept. 10. The all-day conference focused on how sports can bridge religious differences and reduce conflict. It was part of the annual Beyond Sport Summit and Awards, an international event attended by 1,000 people that took place Sept. 9-11 in Philadelphia. Neumann’s participation in the summit happened somewhat serendipitously, according to Lee DelleMonache, coordinator for the Institute for Sport, Spirituality and Character Development at the Aston, Delaware County university. She said Bill McLaughlin, a former university board member, introduced the institute staff to the Rhiannon Group, a global event marketing company that was helping Beyond Sport host the summit in Philadelphia. It turns out the missions of Beyond Sport — promoting, developing and supporting the use of sports to create positive social change across the world – and the institute’s emphasis on the spiritual and ethical dimension in sports were an excellent match. Sessions during the day included two panel presentations, roundtable discussions and workshops on the concept of sports as an effective tool for conflict resolution. DelleMonache said more than 60 international delegates participated in the conference as well as about 300 Neumann faculty members and students and 50 community members. 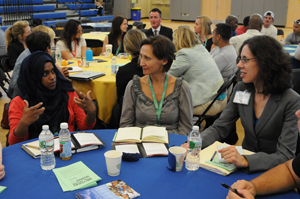 Participants from countries around the world participated in workshops and small group discussions at Neumann University, bringing their perspectives to the day’s theme of using sports as a means of conflict resolution. She noted that Beyond the Divide gave Neumann a unique opportunity to have faculty members from various academic disciplines – philosophy, theology, education, communications and sports and entertainment management – moderate the panel presentation and facilitate discussions during the day. 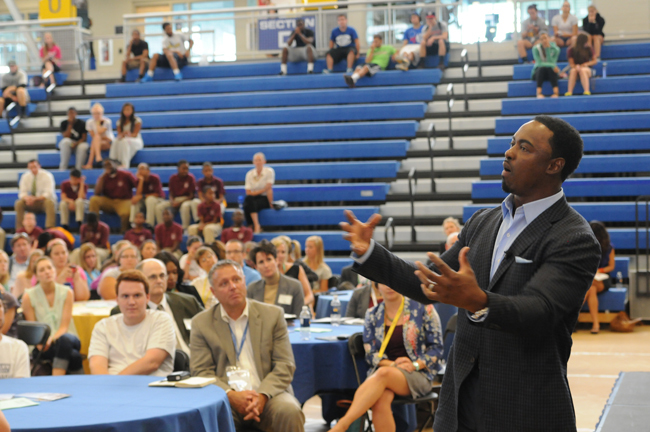 The highlight of the day for many attendees was the closing talk by former Philadelphia Eagle Brian Dawkins. He emphasized the importance of his faith in dealing with conflicts on and off the football field. Other conferences held in Philadelphia included “Beyond Innovation” hosted by the Franklin Institute, “Sport and Sustainability” hosted by Green Sports Alliance at Lincoln Financial Field and “Safeguarding Children in Sport” hosted by UNICEF at the Wharton School at the University of Pennsylvania.